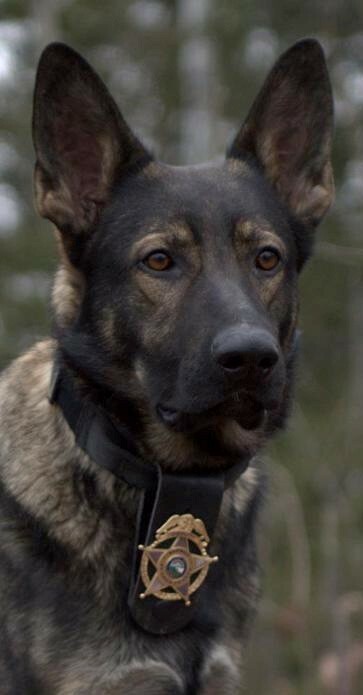 K-9 Kilo is retiring after serving with the St. Louis County Sheriff’s Office since 2011. He will remain with his partner, Sgt. Brandon Silgjord. Submitted photo. ST. LOUIS COUNTY – One of the most popular members of the St. Louis County Sheriff’s Office will be retiring this weekend. K-9 Kilo, a German Shepherd who specializes in narcotics detection and searching for suspect and evidence, has served with the Sheriff’s Office since 2011. Now, at the age of nine, Kilo will transition to full-time family pet, staying with his longtime partner, Sgt. Brandon Silgjord. Even more impressive are the stories behind the statistics. K-9 Kilo has located felons accused of domestic assault in below zero temperatures and found suspects after searching more than 45 minutes in windy weather that dispersed their scents. He’s found people hiding in an outhouse, pontoon boats and small attic areas. Kilo also located an individual who’d attempted suicide, but thanks to the dog’s quick work, the person received the needed care to survive. In recent months, K-9 Kilo has been showing increasing signs of age-related medical concerns, leading to the decision to retire him. The Sheriff’s Office will begin the process soon to purchase and train a new K-9. The cost of a new K-9 is typically $18-$20,000, which includes buying and transporting the new dog, plus as 12-week training course necessary for certification. The AMSOIL Northland Law Enforcement K-9 Foundation will assist with a portion of that cost. Anyone wishing to donate to help with remaining expenses can do so at northlandk9.org. p.m. in the Great Hall. Please arrive before 2:30 p.m. to register in person. You may bring up to two items per person for an informal oral identification and evaluation of each antique. If the piece is too large or fragile to be hand-carried, clear photographs with a description of any marks and labels will be sufficient. Past participants have thoroughly enjoyed the appraiser’s comments on what is always an interesting assortment of antiques and collectibles. ARCO coffee is available while you wait. This session is part of an on-going public education program offered by the St. Louis County Historical Society. Sponsorship does not imply endorsement of this or any other estate/appraisal service, and museum staff is prohibited by professional ethics from making financial appraisals.